Greatness often occurs at the intersection of synergy and serendipity. Athletes, for example, may achieve greatness only if they are born in the right era, encounter coaches who know how to bring out their best, and find themselves among teammates who complement their talents. 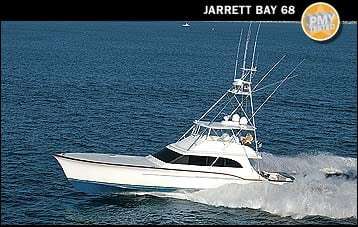 The Jarrett Bay 68 Adaro is a great boat that is the result of synergy and serendipity. 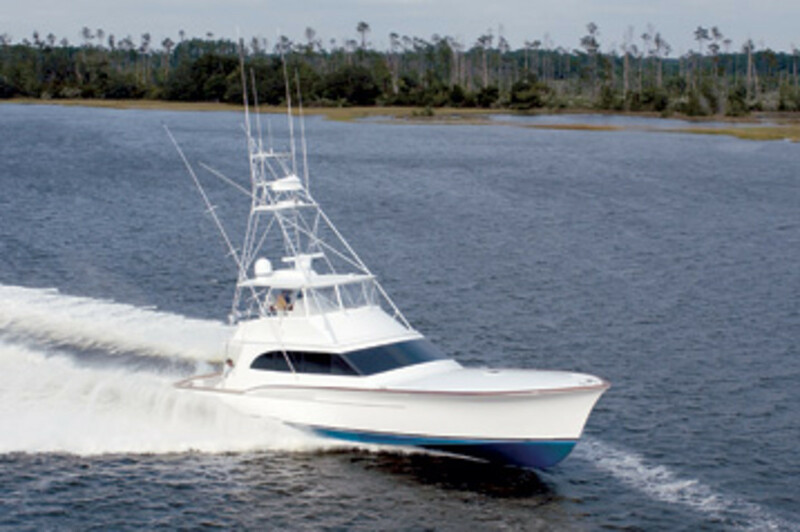 The serendipity happened when Jay and Karen Johnson decided to build a custom sportfisherman and sent out faxes to a number of yards. By chance, Randy Ramsey, president of Jarrett Bay, was standing nearby when his appeared and responded immediately, impressing Johnson. (Other recipients were tardy or—unbelievably—never answered.) The synergy was between Jarrett Bay&apos;s willingness and ability to turn uncompromising visions into reality and the Johnsons&apos; uncommon knowledge of what they wanted. 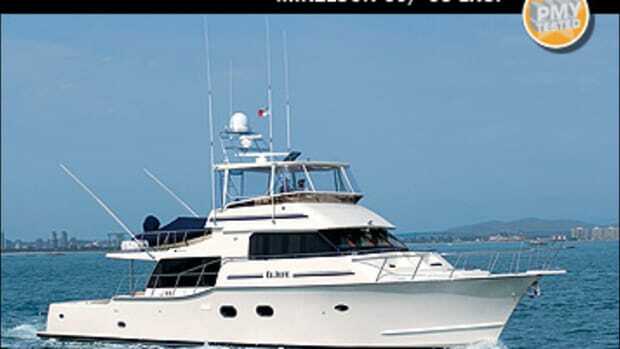 Owners of four boats over 48 feet in the last 13 years, the Johnsons were demanding, not in an unreasonable sense but because they had a concept that encompassed details large and small. You see it the moment you enter the saloon through the pneumatically operated door. It&apos;s big because, as Karen puts it, "This is where we spend our time." 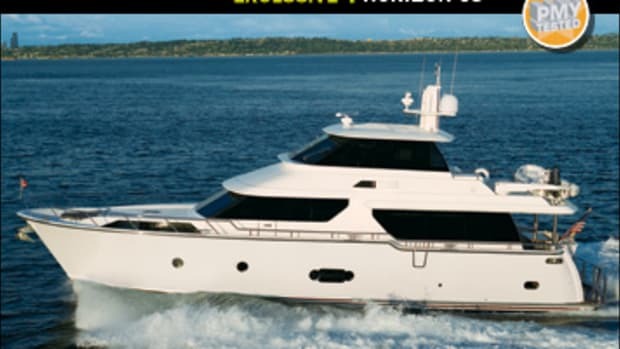 There&apos;s no dinette, the space being dedicated to a full-beam galley forward. The starboard side is the beverage half, and the port side is devoted to cooking. Karen explains that when preparing meals on their previous boat, a 60-foot Huckins that they extensively customized, she was constantly interrupted by people looking for liquid refreshment. So Adaro&apos;s starboard side has two refrigerator drawers, two freezer drawers, an ice maker, drink and glass stowage, and a nifty pull-out coffee maker. Above the aft black-granite counter are two deep drawers with Lexan sides so Karen, who says she&apos;s "not quite 5&apos;1"," can see what&apos;s in them. The aft counter on this side has two bar stools where kibitzers can belly up without disturbing her culinary machinations. "Her" side of the galley has a full-size Thermador convection/microwave/conventional oven, second microwave above, pot and pan and cutlery drawers, gobs of stowage, and an undercounter upright refrigerator and freezer. There&apos;s no dishwasher because, according to Karen, "the only thing people use them for is stowage, and I&apos;d rather have real stowage instead." She also specified the joinery here: flawlessly crafted quarter-sawn, book-matched American cherry cabinets and a stunning cherry and ebony sole. Without a dinette, the rest of the saloon is perforce multipurpose. To accomplish that, the Johnsons turned to Release Marine of Savannah, which created a table that, by mechanical magic, morphs from four feet square to two by six feet. Surrounding it is a U-shape leather couch (rod and dry stowage below) that offers a fine view of the retractable 42-inch Revox plasma TV to starboard. Obviously Karen&apos;s no mere swatch-picker, but Jay&apos;s hand is obvious, too. Forward of the TV he specified a console that tips out of the flawless American cherry and Carpathian elm burl joinery to reveal a Raymarine wind indicator, Icom VHF and SSB, Furuno Navtex, and a computer outlet that lets him interface his laptop with the SSB for e-mail. "It&apos;s slow," says Jay, "but basically free." At the end of the settee by the door, an end table opens to expose a fax machine and satphone. The Bass electrical panel is directly to starboard, notable because Jarrett Bay encloses the back of it in a steel box because, according to Ramsey, "We&apos;ve heard of too many fires starting here." There&apos;s a good deal of iconoclasm aboard Adaro, including her name, which belongs to a half-man, half-marlin Polynesian god of the sea. Also, there are but three staterooms below, the starboard aft one with right-angle berths belonging to the captain. It has direct access to a head that, thanks to a second entrance, doubles as a day head. The port-side guest accommodation offers side-by-side berths separated by a nightstand. Extra-friendly couples who don&apos;t care for twin beds can easily remove the stand, slide the beds together, and reinstall the stand to inboard. The forward master takes a page out of posterity, placing the shower (it&apos;s big) in the forepeak the way boats used to be laid out. 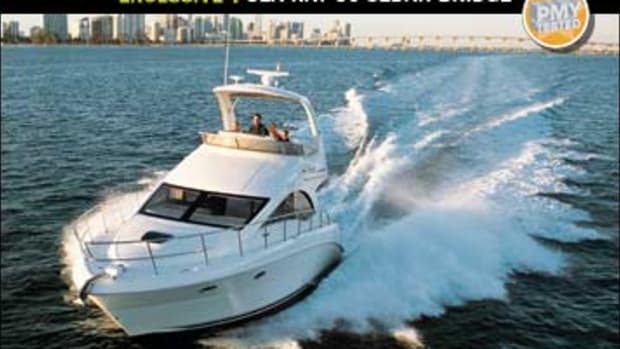 Aft is a separate compartment for the starboard Headhunter MSD (with built-in hamper behind it) and port sink. 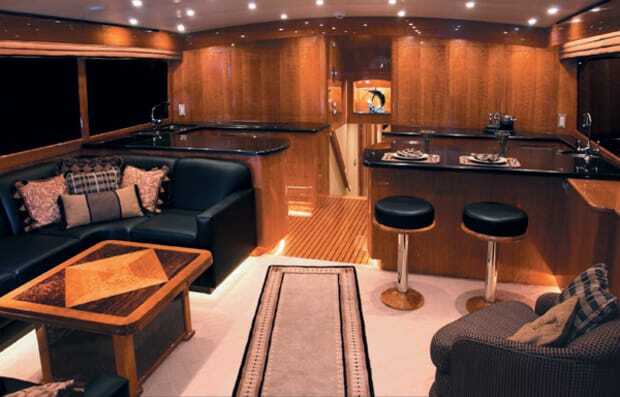 Farther aft, the master berth is angled, and there&apos;s a desk/makeup table (with laptop outlet) and plasma TV to starboard. Next to the berth (on his side), a touch-screen controls the entertainment system and a cockpit security camera. 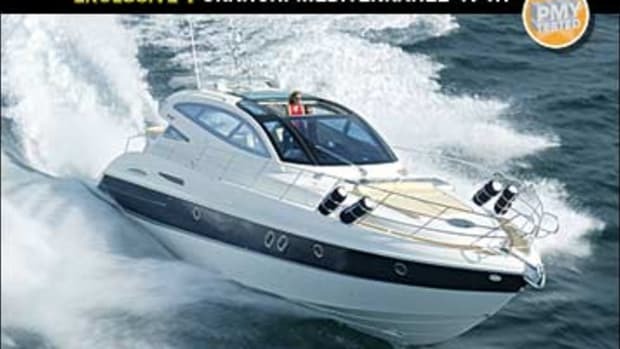 Speaking of security, open the forward starboard hanging locker and twist the coat hook (paying attention, Mr. Bond? ), and the vanity mirror opens to reveal a 12-gauge shotgun, AR-16, two 9mm pistols, and an ammo safe. Despite such obsession with details, the Johnsons never lost sight of Adaro&apos;s prime mission. Serious nontournament anglers whose favorite quarry is sails (although Karen also admits to a predilection for bottom fishing) and who venture as far as Isla Mujeres and Turks and Caicos to find them, they had wanted a clean, uncluttered cockpit. So there&apos;s concealed under-gunwale gaff, mop, and shore cord stowage (Jay eschewed the Glendinning) to either side, a four-foot-deep fishbox serviced by an Eskimo ice maker forward of the fighting chair, and an in-transom livewell with removable partition so it can hold either one or two species of baits. On the saloon bulkhead you&apos;ll see a bait-prep station and lots of drawers, but not one cabinet pull, only foot latches. There&apos;s a transom door but no gate, as both Ramsey and Jay feel it compromises transom integrity. A hatch abaft the chair leads to a large lazarette that&apos;s as finely finished as the saloons of a few production sportfishermen I&apos;ve been aboard. Indeed, besides the superb joinery, it was the finish in spaces not readily visible that impressed me. Every place I looked was not only finished but finished to yacht-level quality. Every drawer is varnished, and every interior space is Awlgripped. The same is true of the engine room, accessed via the cockpit, of which Jay says, "Aesthetically, I tried to create the same impression as the rest of the boat: clean and concealed." Hence there&apos;s a forward pump room that has two of everything ("If you see one, there&apos;s two," he says). There are even two air handlers here to quickly chill the adjacent engine room. The engine room itself is spectacularly white and clean, but two things caught my attention. The battery boxes outboard of the 12V2000s look more like furniture than functionaries, and the duplex DDC Marine Diesel Fuel Processors (a.k.a. fuel-water separators) reside in nooks that are on each side, visible but out of the way. Clean and concealed also describes the large bridge, with a helm well aft for a good view of the cockpit. 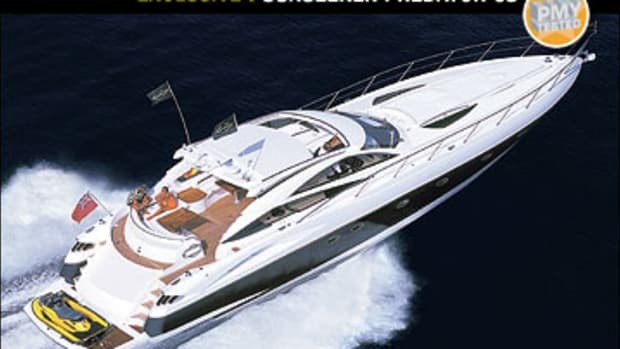 A simple Palm Beach-style helm is supported by two pneumatic pods that raise to reveal an arsenal of electronics and the DDC-MTU monitors. 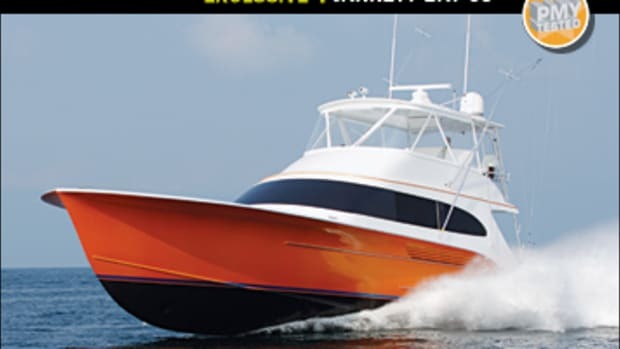 Another pod in the PipeWelders&apos; hardtop provides access to two VHFs, a seawater temperature gauge, and spotlight controls, while over the captain&apos;s pedestal seat is a compartment for the two electric teaser reels. Forward L-shape seats and bench seats offer seating for as many as 12, plus stowage for rods and other gear beneath. The Johnsons&apos; dreamboat includes a cold-molded hull using strips of standard marine and Okoume plywood, depending on the location. Divinycell is used for bulkheads and in doors and lids for lightness, while stringers are of Douglas fir with aluminum reinforcement in the way of the engines. 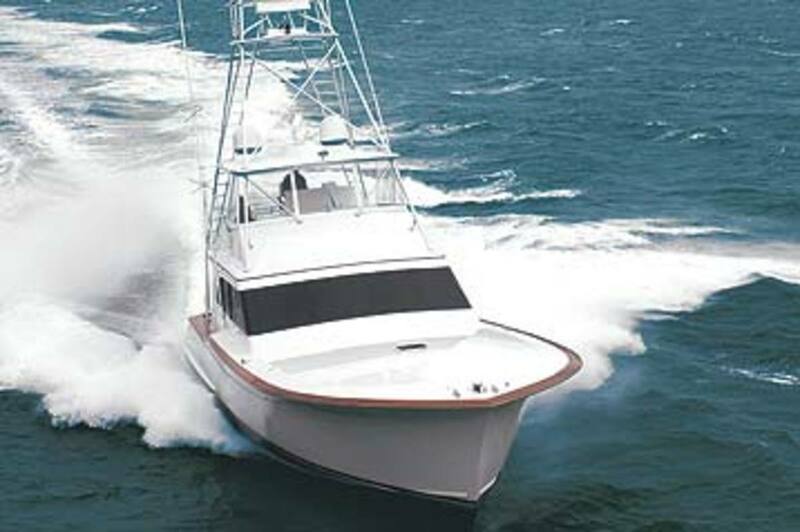 Adaro&apos;s hull has a nine-degree deadrise aft and no lifting strakes or chines, just one full-length spray rail per side, which designer Glenn Haught says reduces turbulence and spray. 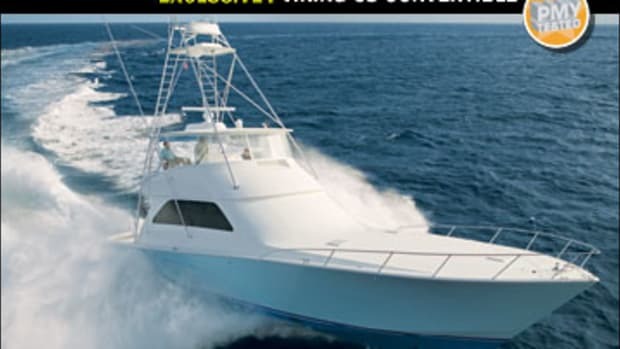 She seemed not to miss the strakes a bit, planing quickly and without exceeding five degrees of running angle—surprising, since her two 1,000-gallon fuel tanks are abaft the engines. 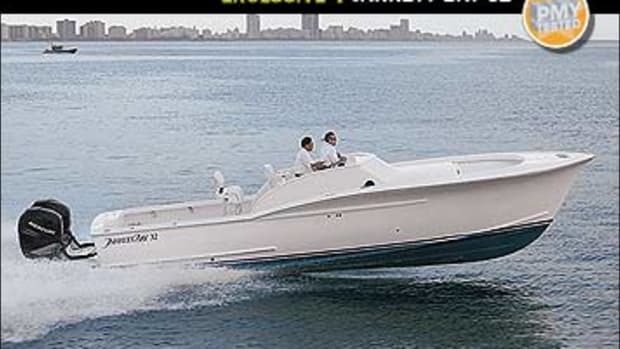 The flat waters of test day precluded judgment of her seakeeping, but I can tell you this 98,000-pounder is fast, having measured a 39-mph top speed with 800 gallons of fuel, nine adults, two children, and one crazy Jack Russell terrier aboard, and tabs up. 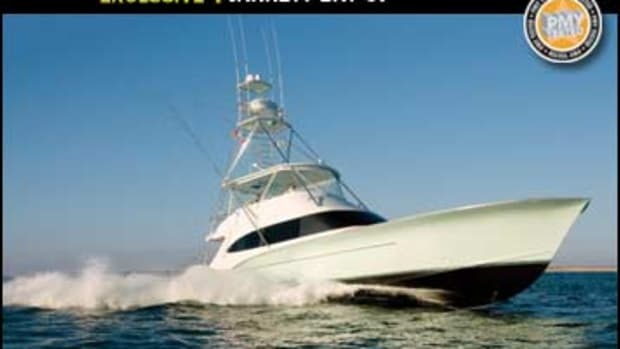 With trim tabs deflected, I measured a remarkable top speed of 45.2 mph. I can also say that Adaro is one of the few great boats I&apos;ve been aboard, and credit for that goes to the collective energy, knowledge, and expertise of the Johnsons and Jarrett Bay. Adaro was 31/2 years abuilding because everybody wanted everything to be perfect and because everyone stretched themselves to the limit to accomplish it, and it shows—everywhere you look and in places you don&apos;t.